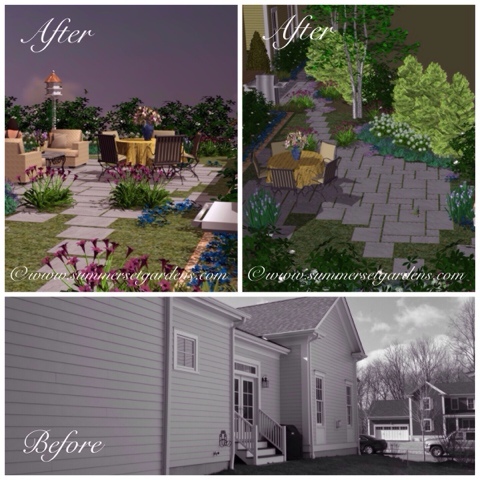 A back yard landscape plan for a residence located in Warwick, NY. I have incorporated a stepping stone path, flagstone patio and bbq area framed with plantings. The back yard is very small with the the surrounding houses close by. The idea is to create an experience of sitting in a garden and to have some privacy without creating a claustrophobic space. I am proposing to slightly sink the patio into the landscape and surround it with a variety of evergreen & flowering shrub groupings that vary in height. Additional details and color will be provided with perennial and ground cover groupings. I want to use a natural cleft flagstone with hand tooled edges to give a rustic, weathered warm feeling for the seating area. The joints will be extra large and planted with low alpine perennials or grass for additional softening of the space. This is one of several design ideas that I presented my client.